Discussion in 'Star Citizen (Public)' started by Wenceslaus, Sep 28, 2013. Are you tired of teenage drama in MMOs? Are you looking for mature behavior and interaction with similarly minded gamers? Do you want to join one of the largest international multi-gaming communities? Are you at least 25 years old and looking for a mature guild where cooperation, help, and real life commitments are valued? The Older Gamers (TOG) is a community that has gamers from all over the world with a total membership in excess of 57,000 people. ships - including 14 Frigates and 5 Destroyers ( as of Dec 2014). As our membership has a broad spectrum of interests, we will be engaging in all aspects of Star Citizen's game play. Why not to browse our public Star Citizen forum to see for yourself? 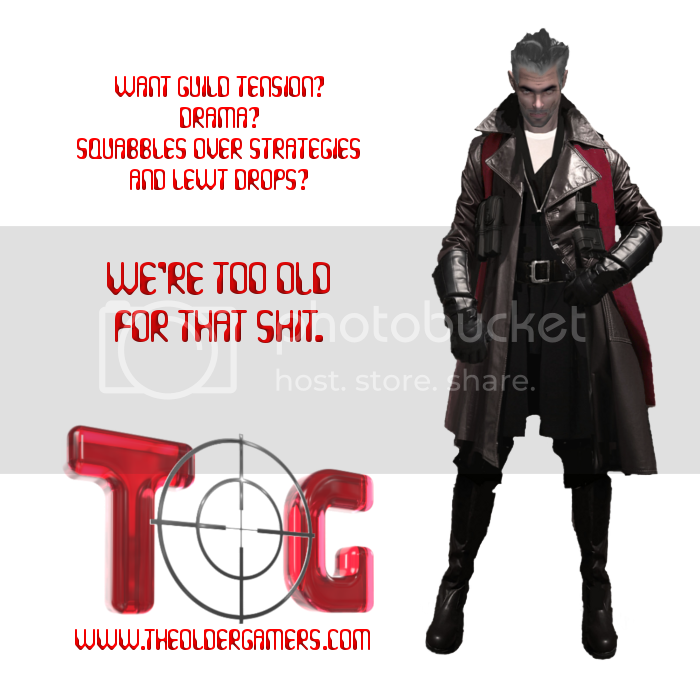 Read more about TOG or how to join us on our Welcome! post. Our RSI Forum & recruitment thread is here and our RSI organisational site is here.